Adjusting Your HDTV Picture Settings? There’s A New App For That! THX Ltd. has released its first mobile application called THX tune-up. It’s specifically meant for consumers to get the best out of their entertainment systems, irrespective of the price and brand. The announcement couldn’t have come better time, with the Super Bowl only a few days away. Talking to Mashable, the director of product management Sandra Benedetto informed that it’s an app that gives guidance and resources not just to the average consumer, but to the average Joe and Jane as well. There are two ways to connect the app to the television; through an HDMI adapter or using AirPlay Mirroring. The description at the App Store suggests the app features custom video test patterns, and variety of tutorials to help the consumers select the best picture settings based on the lightning of the room. 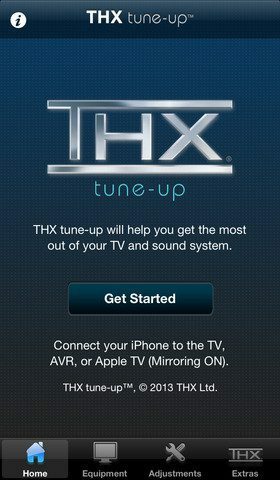 THX tune-app also checks the external speakers and makes sure they’re connected properly with the sound system. The bonus features include THX Deep Note (the cinema sound), THX certified HD trailers, Moo Can and Ask Tex. The supported devices for now include iPad 2, 3, 4 on iOS 5.1.1 or above; iPhone 4, 4S, 5 on iOS 5.1.1 or above; iPad Mini on iOS 6.1 or above and iPod Touch 4G iOS 5.1.1 or above. The company has plans for an android version in Spring 2013. THX tune-up is a no cost download from the App Store for a week till February 4th, but after than will cost $1.99. Leave your thoughts if you try it out!